When children visit the English Riviera Geopark they will be encouraged to explore their environment through a cross-curricular approach encompassing a variety of subjects. The sessions will focus mainly on skills and enquiry based learning encouraging the children to work in teams, solve problems and express ideas. 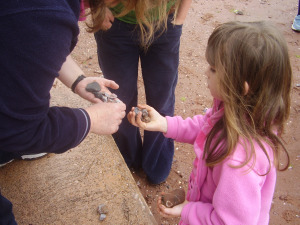 All of the following activities are provided by Torbay Coast and Countryside Trust however Torquay Museum and Kents Cavern also provide a fantastic range of Geopark education opportunities. Geopark Explorers - A day themed around exploring different environments. Children will make comparisons between Torbay past and present and receive an introduction to sustainability by looking at natural and un-natural materials. Time Travellers- A role play game in which the children imagine that they are travelling through time and experiencing Torbay's changing environments. Geopark Trail- A simple trail around the area encouraging children to look more closely at a familiar location by completing different tasks. Beach Scavenger Hunt- In small teams, the children must attempt to collect as many different items (both natural and un-natural) as they can from the beach. The group that collects the most different types of material will win a prize! Mystery Senses Game- The children will be challenged to use all of their senses, except sight, to decide what the mystery beach items are. Sound Maps- Children will use simple dictaphones to record the sounds of the seaside. These sounds can be used in the classroom at a later date. Beach Art- A chance for the children to be creative as they sculpt their choice of marine creature, from either the past or the present. Sealife past, present & future - Children will think about different environments and will make comparisons between Torbay past & present. They will also be introduced to sustainability by looking at natural and un-natural materials. Fossil Hunting- Fossilised corals are easily found in pebbles and in the sea wall. This is an opportunity for children to open their eyes and hunt for hidden treasure. Beach Art- A chance for the children to be creative as they sculpt their choice of marine creature from either the past or the present. Rockpooling- Children can discover more about some of the creatures that live in our seas today and learn about what we can do to look after them. Human Timeline - A discussion activity where the children will need to work as a team and agree on the correct chronological order of historical events. The Expedition - In small teams, the children will embark on their own expedition using their orientation skills to explore Goodrington Sands and complete a series of challenges. The Discovery - After completing all of the challenges, the teams will follow a map to a secret location where they will need to identify a prehistoric creature. Litter Pick - The children will carry out a short littler survey of the beach. They will then sort the litter into categories and think about where it may have come from. Beach Art - The children will work in small groups to make a sand sculpture using natural and un-natural materials. The sculpture must be of a marine animal and the children will think of the threats facing their chosen animal and ways that it could be protected. Rocks and Soils - Children will become rock detectives and soil scientists as they take part in activities and experiments to find out about the properties and uses of local rocks and soils. The Rock Cycle- Using a large scale rock cycle diagram, children will learn about the different rock types and how they are formed. Coastal Erosion- By making a miniature Torbay in a tray, children will try to work out how the sea has shaped the coastline over thousands of years. Who Ate My Lunch? Children will become detectives as they attempt to solve the mystery of the missing lunches. They will need to work together to carry out a series of experiments on different soil types as they look for clues to catch the culprit. Coasts - Will Torbay last forever? Children will become coastal developers and learn about the natural and human influences that are affecting our coastline including erosion and the pressures of tourism. Waves- Children will find out about different types of waves, how they are formed and how they can affect the appearance of beaches. Beach profile- Children will use simple equipment to measure the length of the beach and how much it slopes. Tourism- Working in teams, children will need to design and build their own seaside resorts taking into account the views and opinions of different community groups (Local residents, holiday makers and environmentalists). We are also happy to accommodate half-day visits (2 hours) for any of the above topics just let us know which activities you would like to include when you make your booking. Seas of the Past (2 - 2.5 hours) Travel back in time to meet some of the strange underwater creatures that used to live in Torbay and learn about the wildlife that we find around our coasts today. 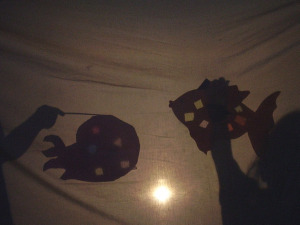 Children will design and make their own sea creature shadow puppets and then work in teams to put on a show. Please note that there is a small charge for this activity to cover resources, please contact us to make an enquiry.